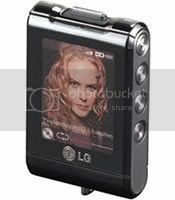 LG FM30 Portable Digital Player: Don’t let its small matchbook size fool you – the 2006 CES Innovations Honoree LG FM30 is loaded with advanced features to enhance the consumer experience. Going far beyond standard portable digital players, the LG FM30 has a battery capacity that can power up to 60 hours of continuous music playback, reducing the hassle of frequent recharging. With a storage capacity of 1GB, the LG FM30 player can store up to 250 songs, 100 music videos or 1,500 photos. The LG FM30 can also play multiple music files, including MP3, WMA, OGG and ASF, as well as MPEG4 video. The LG FM30’s 1.77-inch 260K colour OLED provides vibrant images for video and photos. Only 2.4 inches tall, 1.6 inches wide and 0.55 inches deep, the tiny LG FM30 also comes with an attachment to wear the player fashionably around the neck for people on the go.